The greatness of the Tyco dinosaur lines (Tyco stripped away the crazy armor and re-released most of these toys under the Smithsonian banner in the early '90s) can be at least partly attributed to the involvement of Bob Bakker, the man who literally invented the Dinosaur Renaissance. 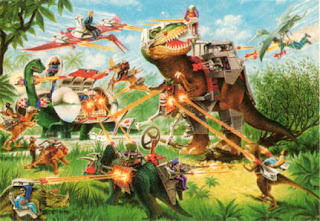 Bakker was tapped as a consultant on the line, and while the details are limited to online rumors repeated decades after the fact, despite resistance from Tyco, he managed to get a lot of extremely current (at the time) ideas about dinosaurs into the toys. Bakker apparently quit as consultant part-way through his gig, supposedly because the toys weren't accurate enough for him. But it's clear that at least some of his ideas were used. There is a striking uptick in quality and accuracy between series 1 and series 2 of the line. I don't know when Bakker quit, but I have to wonder if it was after having his more quirky and accurate choices for dinosaurs rejected; then, needing more material for series 2, Tyco caved and just used all of his dino deep-cut designs anyway. Bakker has apparently stated that his favorite of the line is the series 2 Dimetrodon, which we can safely assume he designed. It was rumored that Tyco rejected his more... Bakkerian design for Stegosaurus, opting instead for a classic, old-school version right down to the red-green color scheme. But they also repurposed his design as a Kentrosaurus in the same series (perhaps feeling that kids would accept a more unfamiliar take on a more unfamiliar species rather than a well-loved staple). Series 1 definitely features a lot more "safe" choices than series 2. Diplodocus, Tyrannosaurus, Triceratops, and "Ankylosaurus" (really Euoplocephalus) were followed up with the likes of Edmontonia, Saurolophus, Lystrosaurus, and, of course, Struthiomimus. Like other "ostrich mimic" dinosaurs, Struthiomimus has a puny head with a broad, beak-edged snout. The head is too small in the Tyco action figure to display much detail or texture, but it fits the contours of the real skull very well. Though often reconstructed with a flatter, narrower head, this version has a broad head with a very high cranium, big eyes, and a concave snout, giving it an arched-eyebrow appearance. As you can see above, this is very true to at least one real specimen of Struthiomimus altus, and while I'm not sure if some of its unique features are due to age, at least its scientifically sound. The nostrils are right at the tip of the snout, where they should be. Fossilized ornithomimid beaks show that they only extended a little above and below the bony margin of the jaws, so the invisibility of the beak in a toy with this scale and resolution is to be expected. It has feathers. Feathers! This is something I never really took notice of as a kid, or if I did, I didn't dwell on it. 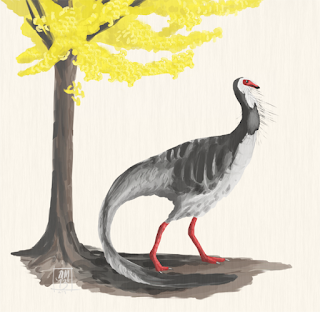 I'm not sure if I had encountered any feathered dinosaurs in books by that time, other than maybe Avimimus. I think I may have just taken this to be the kind of quirky speculation or weird texturing you sometimes saw in dinosaur books of the late '80s. But compare this to other Dino-Riders toys. One of the great things about them is their amazing scalation. Especially in the series 2 dinosaurs, the scales are beautifully sculpted in different varieties across the body, with large scales and small scales, round scales and rectangular scales, just like in real dinosaur skin impressions. So there's no way it's a coincidence that the only figures with this wavy, striated sculpt are Struthiomimus, the pterosaurs, and of course the mammals. I have to imagine Bakker pushed for feathers on Deinonychus as well, which as it stands looks very '70s and has terribly inaccurate arms. They'd already released two deinonychi in series 1, so I guess an updated version was off the table for series 2. Too bad. The feathers cover the entire body save for the head, upper neck, and throat pouch, which are smooth (as in Pelecanimimus, right down to the pouch, a dinosaur that was discovered a full decade later!). The feet and fingers are also featherless and feature bird-like scutes (this may be inaccurate, at least for the hands). The neck is definitely too long, which was a common problem back in the day. A lot of artists looked at articulated specimens with back-bent necks and failed to notice that some of the vertebrae on the base of the neck had ribs on them (because they were misplaced back bones). This had the effect of making ornithomimid necks look longer than they really were in many cases, to the untrained eye. If you look at "classic" depictions of Struthiomimus by Charles Knight and others, it matches them well in terms of posture and proportions, while adding a certain dynamism that reflect the Dinosaur Renaissance era. The torso itself is slender and horizontally posed, though a bit too shallow. The pubic boot is distinctly sculpted and narrower than the rest of the belly, but it ends well above the knee, when it should be about the length of the femur. The side of the body has a little roll of skin adding some character to it. In reality, the feathers probably would have been long enough to hide a feature like this rather than accentuate it. But of course, they didn't know that in 1988. Check out the detail on the underside of the body. The feathers are sculpted alternating at an angle to the midline, like the fur on a dog's belly. Neat touch! The tail is broad and powerful-looking, especially around the base, as it should be. No shrink-wrapping here. Of course, the glaring error is how sharply it is bent towards the ground, like a kangaroo tail. The shape of the tail vertebrae would simply not have allowed that degree of flexibility. It's a shame, because the overall posture is simply incredible looking - it looks lifelike, even though the bones tell us it's not. It just exudes something out of a classic, early 20th century dinosaur painting. Struthiomimus didn't really look like this, but it should have (now I sound like one of those monster movie raptor fans). I like the posture of this figure so much I tried to adapt it as closely as possible within the realm of accurate, 2010s-era science. You can see the result below (though note that someone who's had first-hand experience with ornithomimid tail bones has informed me that even this might be going a little too far in the degree of bending). Ok, this is 1988 we're talking about. The theropods are going to have pronated hands. But these are actually angled outward a little bit, not in a complete bunny posture. And the fingers are all the same length, as they should be, with the right kind of big, broad claws (or at least as close as they could get at this scale). The hands are covered in tiny scutes, and the feathers on the underside of the arms have the same alternating diagonal pattern as the belly. The leg proportions look accurate, and they're well muscled, giving the impression of a strong runner. The feathers end just above the ankle joint and, in another neat touch, the bottom of the "drumstick" has sculpted wrinkly skin which grades into scales on the tarsus and toes. The wrinkly texture continues on the underside of the feet. The toes look ok if a little blocky in their sculpt. As discussed above, the sculpt on this figure is very detailed and very crisp. It's a shame that when the figure was re-released under the banner of the Smithsonian, the details seem to have been wiped out. Whether this was an issue with the original mold the figures are cast from, or the Smithsonian trying to be more conservative by erasing the feathers, I don't know. But you can see the "updated" version here. This is an action figure, but just barely. The arms are articulated, and the legs look like they should be, but they're glued down and immobile. The figure has issues with stability even with its tripod stance, so maybe Tyco decided at the last minute to nix any leg articulation. I really like the color scheme. Unlike some of the duller Dino-Riders, while the colors are still muted earth tones, the patterns are really nice and the coloration brown with beige highlights, with a light gray base, blends nicely, creating a natural looking effect with minimal paint. 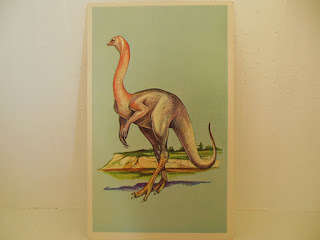 Binney & Smith Struthiomimus flash card, 1975. It appears that the general color scheme and pose of this figure was heavily inspired by a vintage 1970s dinosaur card. 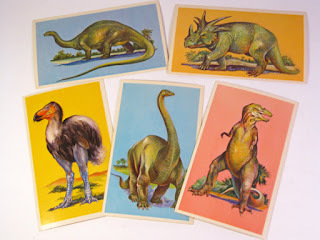 Pictured above, it came from a set of "edu-cards" called "Dinosaurs and Prehistoric Animals Flash Cards" released by Binney and Smith, the makers of Crayola Crayons, in 1975. In fact, I would bet a good portion of the first series of Dino-Riders toys took inspiration from these cards, as their general color schemes and poses match pretty well. Compare the images below with the Dino-Riders Brontosaurus, Monoclonius, Tyrannosaurus, and Diplodocus. While this could simply be a coincidence as all of these are fairly generic old-school dinosaurs (and many of the cards were shameless Knight ripoffs themselves), the influence on Struthiomimus in particular is obvious. All of the Dino-Riders series 1 toys were notoriously "vintage" looking compared to the more Bakkerian second series, a fact which Bakker famously complained about. The Struthiomimus toy, produced in 1988 (in between the two eras - most of series 2 bear a 1989 stamp), melds the two aesthetics. Classic (read: old-fashioned) pose and proportions, but with a more modern spin lent to it by the feathers. As with other Dino-Riders figures, scale doesn't seem to have been a consideration. The dinosaurs are not in scale with each other or with the human figures that came with them. The Struthiomimus measures 20 cm long from its snout to its tail tip along the curvature of its vertebral column. Based strictly on total length, it's scale would be 1:21 based on a 4.3m long individual. But as we've seen, the neck and tail are both a little too long compared to the real animal. Since the head closely matches the skull of a real specimen, I'm going to use that as the basis for scaling this figure. The head on the toy is 1.5cm, and the skull from the Cuff and Rayfield paper linked above is 18.5cm long. So based on that, which corrects for the added length from the too-long neck, the scale is actually 1:12. This just goes to show the importance of scaling to single elements rather than total length! This is one of my favorite dinosaur models of all time. It's not that accurate by modern standards or even 1988 standards, but it's a beautiful figure and... you know... feathers. In 1988! (Also, I'm slightly biased, because Struthiomimus was my favorite dinosaur as a kid. By the time I got this figure, I had already worn the paint off of two Playschool Struthiomimus' beaks by having them "eat" too many grape "eggs"). Accuracy: 2/5 - Points for accurate head anatomy and feathers, but the pose and proportions are out of date and even the exact type of feathers turned out to be wrong. History: 4/5 - It had some accuracy problems even by 1988 standards, but the designers seem to have consciously sacrificed some accuracy for aesthetics and a "classic" look. Plus, the first ever feathered dinosaur toy, ever. That counts for something. Sculpt: 3/5 - Very nice details with subtle touches you can only see on close inspection. Still a bit blocky in places, though. Paint Job: 4/5 - Minimalistic, but it works and looks great. Aesthetics: 5/5 - One of the most gorgeous dinosaur figures ever made, aesthetically speaking. I had one of these as a kid and also really liked it. Unfortunately, my younger sister, in playing too rough one day, managed to break off both it's legs below the 'drumstick'. Nice article, and I had that toy as well. 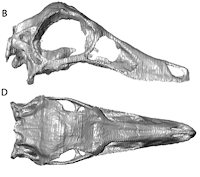 However, the skull similarity is coincidental, since that specimen (RTMP 90.26.1) was only discovered in 1990. Two years after they toy was released. The "flatter, narrower head" of other reconstructions was based on the only other specimen to preserve the dorsal outline, ROM 1790 (as illustrated by Russell, 1972). ROM 1790 has since been redescribed as Rativates.